I had an opportunity to talk with William Blumberg about his commitment to the University of North Carolina earlier this month at Wimbledon and this article for the Tennis Recruiting Network is the result of that conversation. The top-ranked recruit in the Class of 2017, Blumberg plans to start school in January. With Brayden Schnur, who has played No. 1 for the Tar Heels the past three years, announcing today that he has turned pro, Blumberg will be asked to contribute immediately. Today in Memphis, the brutal heat continued, with the high temperature topping out at 100, and the heat index nearing 120. As a result, the quality of the tennis in the quarterfinals of Girls 18s Clay Court Championships was uneven, although No. 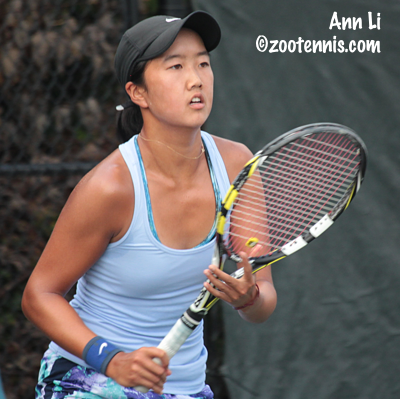 4 seed Ann Li managed to maintain her level, advancing with a 6-0, 6-1 win over unseeded Chelsea Kung. Li, who has lost only 10 games in her five wins this week, said she has found her form on the surface. "I think I'm really comfortable on clay now," said the 16-year-old from Pennsylvania, who trains with the USTA in New York. "I was practicing on clay before I came here and I'm moving really well and playing my game, executing well." Li said she finds the conditions in Florida, where she also trains occasionally, even more oppressive, although she admits her short match times have made this week less taxing than it could be. "It really helps to quicken the match, not drag everything," said Li. "I can save my energy for later matches." Li will play unseeded Chiara Lommer, who outlasted No. 9 seed Elysia Bolton 6-3, 7-6(4). Bolton became ill late in the second set of the match, vomiting on the court when returning serve leading 6-5. A delay to clean the court did not derail Lommer, who held serve and then closed out the match in the tiebreaker. "She really hid it well," Lommer said of Bolton's difficulties. "I had no idea up until 5-all, when she went up to the ref and told him. She was doing a great job, playing and competing really well." The first set saw Lommer get a break in the fourth game and she made it stand up. Lommer served well, while Bolton's backhand was the source of most of her errors. The second set was the opposite of the first, with eight of the first nine games going to the returner. "I was just not concentrating at all on my service targets," Lommer said. "I was starting to groove a little bit more on her serve and I think she was doing the same with my serve." Bolton was up 4-2 and 5-3, but was immediately broken right back. Serving for the set, Bolton didn't make Lommer work for the break, with unforced errors sandwiched around a good return and a double fault putting the set back on serve. Lommer began to serve better in her final two service games, and although she held service only twice in the tiebreaker, that was enough, with Bolton sending a final backhand long on Lommer's second match point. Lommer, who played in Europe this summer and qualified for the Wimbledon Junior Championships, had to adjust to the major changes in temperatures and surface in a short time. "I just came from college orientation too," said the 17-year-old left-hander from Illinois, who starts at the University of Michigan this fall. "So I didn't play the entire week leading up to this. And coming from the grass to the clay was a bit of an adjustment, and I'm still having a tough time with the footing on some balls. The heat is different. I'm used to it now, but the first two days were a struggle." 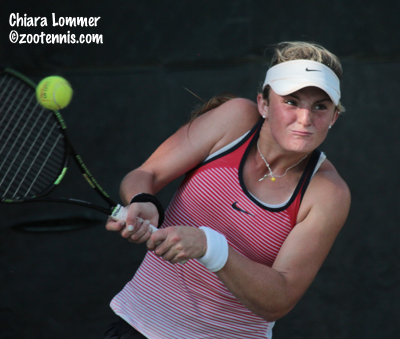 Lommer, who is 116 in the ITF World Junior rankings, took out a No. 9 seed in the second round, and admitted to being puzzled by not receiving a seed in this tournament. "They say there's a seeding committee, that is apparently supposed to seed based off of ITF and UTR and everything else," said Lommer. "I don't know. This is my last junior tournament, so seeded or not seeded, I was going to give my best." Lommer is not playing the Nationals in San Diego, opting for a vacation before she starts college. "This is my chance here," she said. The semifinal in the top half features two No. 9 seeds. Isabella Lorenzini took out top seed Janice Shin 6-3, 6-3 to set up a meeting with Amanda Meyer, who advanced when unseeded Nina Sorkin retired with an ab injury after losing the first set 6-2. Lorenzini got off to a quick 4-1 lead in the first set, and although she was unable to serve out the set at 5-2, Shin, unable to play her usual consistent game, was broken for the fifth time to give Lorenzini the set. Shin's shouts of frustration at her unforced errors multiplied in the second set, even though she was able to stay close in the early stages. But after Lorenzini broke her from 40-0 up to take a 5-3 lead, Shin was in a tough spot, and Lorenzini closed out the win by taking the last four points after trailing 0-30. The doubles semifinals are set, with the top four seeds advancing. No. 1 seeds Lexi Mulinovich and Amanda Rogers will play No. 3 seeds Anna Brylin and Li in one semifinal and No. 2 seeds Bolton and Abigail Chiu will play No. 4 seeds Lommer and Victoria Flores. The finals are set for the 12s and 14s divisions in the National Clay Courts. In the boys 12s, No. 1 seed Evan Wen will face No. 6 seed Victor Lilov. In the girls 12s, No. 6 seed Katja Wiersholm (Henrik's sister) meets No. 2 seed Robin Montgomery. In the boys 14s, the Khan brothers, Faris and Zane, who played each other for the gold ball in both the 12s Clay Courts and 12s National Hard Courts in 2014, will meet again for a USTA National title. In the girls 14s, Ellie Coleman will face Christine Canete in the final.